If you’ve never tried it, yoga may appear to be a trendy hobby for hippie ballerinas with perfectly coiffed messy buns and pricey Lululemon leggings. You might worry you’ll be out of place in the domain of tall, fit ladies with perfect bone structure who buy their groceries at Whole Foods. But yoga is for you. The fact is, yoga isn’t a passing fad. It’s an ancient Eastern practice that we are blessed to enjoy in our globalized world. And everyone is welcome to practice yoga. I once attended a yoga class with a couple dozen women of all ages and sizes, as well as one big, sweaty guy who passed quite an audible amount of gas during some particularly challenging vinyasas. And you know what? No one so much as snickered at his booming flatulence. Because the code of yoga class is good will, love your body, and nobody judges. You can find a yoga class for any level of expertise, fitness, or health. Some classes are designed to strengthen your core and challenge your flexibility and balance. But there are also classes specifically for people who are in significant pain, pregnant, recovering from a surgery, etc. I attended an adaptive yoga class when I was eight months pregnant, along with elderly people and those with back and/or knee pain and injuries. Our instructor took care to find out each attendee’s needs and physical abilities, and she designed our practice accordingly. If you are in pain and can’t attend an adaptive yoga class, every pose can and should be adjusted so that it feels comfortable for you. Yoga isn’t about pushing through pain; it’s about listening to your body and doing what feels right. Arrive early to class, and explain your individual needs to your instructor—they will help you adjust poses so they are safe and healthy for you. Savasana (corpse pose) is traditionally the final pose of any yoga class. It involves lying flat on your back and engaging in calm reflection. If lying on your back, breathing in and out, is the only activity you can comfortably do (and you can even adjust savasana to elevate your back on cushions or sit up in a chair if you need to), you can spend a few minutes in savasana and boom—you worked out today! Mental-health professionals prescribe yoga to treat trauma survivors. A healthy heart rate varies, but those who have suffered significant trauma experience poor HRV (heart rate variation). Inhaling activates the sympathetic nervous system and increases your heart rate, while exhaling employs the parasympathetic nervous system and slows your heart rate. Because so much of yoga is about breathing, as you deliberately breathe in and out during poses, your HRV improves. But yoga is more than breathing. Yoga feels amazing. I first tried yoga during a women’s activity night at my church. I had no idea what to expect, but afterward I felt relaxed, alive, and euphoric. Over the years I’ve tried all different types of exercise. From running to weightlifting to high-intensity interval training, yoga is the only physical activity I’ve found where I consistently feel great during the process, not just afterward as a post-workout reward. Yoga is about intentional breathing while moving, stretching, and holding poses all while practicing mindfulness, meditation, and creative visualization. Yoga’s magic mind-breath-movement formula has been empirically linked to a wealth of benefits, such as alleviating physical pain and depression, releasing tension, lowering stress, improving sleep quality and immune functioning, as well as increasing flexibility, posture, muscle mass, bone health, etc. 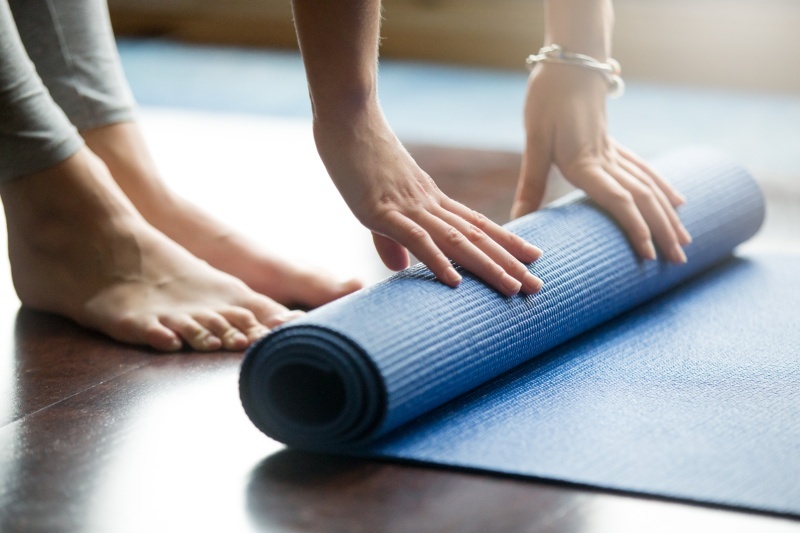 Yoga is typically available at a variety of locations: gyms, fitness centers, and dedicated yoga studios in your community. Find a class that meets your individual yoga needs. It’s perfectly fine to shop around until you find what you’re looking for. Is your goal to become physically stronger and more flexible? Or are you seeking stress relief and meditation but don’t know if you’re physically ready to stare at the floor with your bum in the air while holding downward dog pose? Communicate those needs to your instructor. They can often direct you toward a class that’s right for you. There is also a wealth of online, prerecorded yoga classes to explore. It may be most convenient and affordable for you to practice yoga in your own home. But please note that there’s no match for a live yoga instructor who can help you learn poses and tailor your practice to your needs. You may decide to take classes in person until you feel like you’ve got the techniques of yoga down. Each yoga class ends as both instructor and students utter “namaste” with a bow with palms together over heart in prayer position. Namaste means “the light in me honors the light in you,” or “the beauty in me salutes the beauty in you.” And that’s the essence of yoga—we all have the divine in us, and yoga is about accessing and acknowledging that.